Elija Titus Latunde was born in January 1905 at Ile-Lodi, Moore, Ile-Ife in the present Osun State. Latunde’s parents were Pa Fasanmoye and Madam Fapowopo Eluyo who were both idol worshippers. Latunde had a sister named Alice Omiwara and a brother named Samuel Adebanjo. 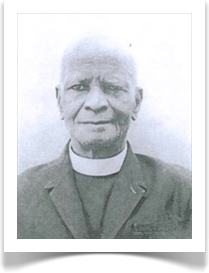 On January 7, 1917 Latunde was baptized in St. Phillip’s Anglican Church, Ayetoro, Ile-Ife and received the name Titus. In January 1922 Latunde entered All Saints School, Osogbo. From 1924 to 1927 Latunde was at Government School Oranyan, Ibadan. And between 1928 and 1929, Latunde attended Government Teachers Training College, Warri, now in Delta State. When he was living with his uncle, Mr. Arewa, he obtained the admission to sit for the entrance examination at Warri and one of his fellow candidates at the examination was Chief Festus Awosika. Before he entered the examination hall, Latunde was hail and hearty but as he sat down to start the examination, he discovered that he could not read the question. That was how Latunde’s ambition to further his education was aborted (pp. 181-182). Latunde then opted to work in petty trading, selling shirts, ties, and suits in Ibadan. Latunde’s worsening eye problem became a major source of worry for his family who sought medical help in many ways and places. Assisted by a man named Mr. Ademakinwa, Latunde went to seek medical treatment in Lagos where doctors declared his condition hopeless. Not discouraged by the poor medical report, Latunde returned to Ibadan where he heard about Faith Tabernacle Church. Latunde joined the church and resorted to marathon prayer and fasting for victory and healing. He regained his sight after washing his eyes in a bowl of blessed water at the worship place in the house of Oba Akinyele. This marked a turning point in Latunde’s life. In 1930 Latunde became an evangelist under Prophet Ositelu in Ijebu Iremo in the present Ogun state. In 1931 Latunde became one of the preachers in Oba’s palace. In 1932 Latunde became a salaried catechist, receiving a salary of one pound ten shillings (300 Naira or $3) per month and was later posted to Akinkemi village as a catechist. In 1935, Latunde was ordained a pastor in Christ Apostolic Church. In 1938 Latunde was sent to oversee the church in Ile-Ife, his hometown, and other places like Apomu, Ikoyi, Ago-Owu, Ikire, Gbongan, Ile-Ife, and Modakeke–all in the present Osun state. 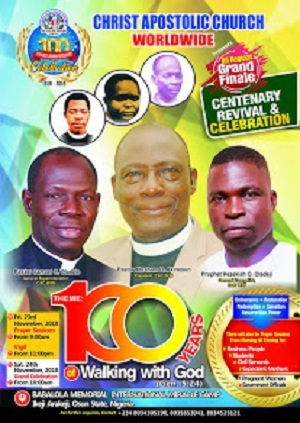 Latunde’s arrival at Ile-Ife brought unprecedented revival to the church. His revival services were marked by miraculous events. For instance, on one occasion, rain threatened to fall. Not only would it have disturbed those at the venue, but it also would have prevented many people from coming to the revival grounds. Latunde declared it would not rain and, true to his words, it did not rain again. This amazed many people who later gave their lives to Jesus. At another revival in Ipetu-Modu, a suburb of Ile-Ife, about 600 people attended the services every day. In 1937 Latunde married Miss Comfort Oyepeju Abioje, a native of Ibadan. The family was blessed with many children, one whom is Pastor Layi Latunde, an ordained pastor in Christ Apostolic Church. Latunde experienced stiff opposition from witchdoctors and the forces of darkness. In 1936, the church needed a parcel of land at Ile-Ife. Latunde made his request to the Ooni of Ife, Oba Adesoji Aderemi who gave them a sacred forest named Igbo Olose which means “the abode of evil spirits.” The forest was dreadful and only fetish and Ifa priests dared venture into it. There were many sacred trees worshippers had draped with cloths, sacred hens without feathers, goats, and many other things. Nevertheless, in January of 1937, the youths lead by Latunde entered the forest. Before clearing the forest, Latunde asked Mr. Ademakinwa to read Psalm 24 and everyone sang a hymn. Then Latunde took his cutlass, shouted “In the name of the Father, of the Son, and of the Holy Spirit!” and started to clear the forest. Seeing this, all the youths followed suit and the forest was cleared. The headquarters of Christ Apostolic Church and Ile-Ife district coordinating council stand on that land today. Latunde’s influence in Ile-Ife extended to other towns like Osogbo, Ikere, Modakeke, Apomu, and Ikoyi. Nearly all the other branches of Christ Apostolic Church can trace their origins to his influence. Latunde rose to the rank of district superintendent and assistant general superintendent (AGS) of Christ Apostolic Church. In 1967 Latunde was promoted to the highest office in the hierarchy of Christ Apostolic Church and became the president of the church. As president of Christ Apostolic Church Worldwide, Latunde moved to Ibadan where the headquarters are located. Latunde performed feats in the area of education in the church. In 1939, Latunde established primary schools in Christ Apostolic Churches at Oke-Isegun, Moore, and Ile-Ife. Other primary schools were started in Ifetedo, Ipetu-modu, Edunabon, and Tonkere. Latunde was the coordinator/manager of these schools until May 19, 1960, when the government of Nigeria took over the management of the schools. Latunde’s tenure as the third president of CAC Worldwide (1967-1983) brought unprecedented growth to the church. The church grew in its different dimensions: numerically, organizationally, cross-culturally, and spiritually. During his tenure the CAC publicity department and CAC Printing Press were established. 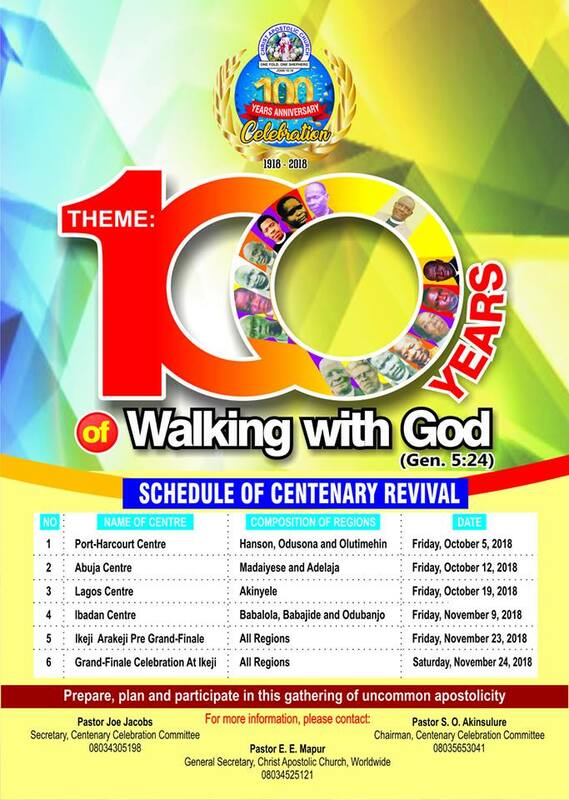 Other projects and programs which grew up during that time were the CAC Almanac, the Christ Apostolic Magazine, the CAC Youth Fellowship, and the CAC Ordained Ministers’ Wives Fellowship. These all still exist today. Latunde did not only limit himself to church activities. For example, Latunde was a member of a cooperative organization, Ife Produce Marketing Union Limited, of which he eventually became the supervisor. In 1944 Latunde became the manager of the organization. In 1954 Latunde became one of the founders of the Ife Cooperative Bank. The same year he was appointed vice chairman of the Cooperative Union of Western Nigeria, eventually becoming chairman in 1963. In 1965, Latunde became treasurer of the Cooperative Bank of Western Nigeria and in 1969 moved on to be chairman. In 1965, Latunde became chairman of the Cooperative Federation of Nigeria and from 1960 to 1970, he was a member of the central committee of the International Cooperative Alliance. From 1955 to 1965, Latunde was one of the directors of the Western Nigerian Marketing Board and Western Nigerian Development Cooperation. Later, Latunde joined the board of directors of the West African Cocoa Research Institute and Cocoa Research Institute of Nigeria. Latunde thus had the opportunity to travel to places like West Germany, Switzerland, Sweden, Israel, France, Australia, Brazil, the U.S.A., England, Bulgaria, and Yugoslavia. He spoke Yoruba and English. Latunde was a peacemaker. He was appointed by the Ooni of Ife to settle disputes among the Muslims in Ile Ife land. With prayers Latunde resolved matters amicably. As a result, the Ooni offered Latunde a chieftaincy title of “Atunluse of Ile Ife.” Not wanting to confuse his followers, Latunde respectfully declined the offer saying he was satisfied with his position as president of Christ Apostolic Church. Latunde died peacefully on May 22, 1983 at the age of seventy-eight. He was a wonderful leader who welcomed all people regardless of their rank. This article, received in 2006, was researched and written by Dr. Kemdirim O. Protus, a senior lecturer in the Department of Religious and Cultural Studies at the University of Port Harcourt, a DACB Participating Institution. Dr. Kemdirim Protus is also the DACB Regional Coordinator for Nigeria. Such an Inspiring personality and a worthy example professionally and spiritually. May we live in the lights of the trues passed on by our founding fathers in Jesus name. God bless Christ Apostolic Church. Enter your comment...i really love our founding fathers simply because of the humility of God they exhibited. CAC is coming back to life in Jesus' name .